For performing Gaya Srartham NO thithi, vara , nakshatra etc. is taken into consideration. The day need not be the Srartha Thithi of our beloved parents (can perform for father alone if mother is alive). We can perform Srartham (its only called Pinda Dhanam) any day - month - star - thithi etc. No Madi Acharam etc need to be seen in Gaya - as it is the holy ceremony performed to all the 7 Thalaimurai souls, starting from our parents. The priest / vadhyar at Gaya explains in details; especially about Mathru Karma - and no one will be left without Crying. When Pindam is offered to Mother and her side - he explains the value and the glory of a mother!! if any one happens to hear the same, surely (if any one is survived with mother) they will never let her in old age home. If we need to perform Gaya Srartham only to father - then 32 pindams are offerred. 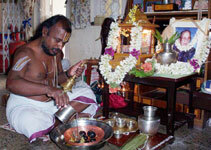 If the Srartham is to be performed for both father and mother - then 64 pindams are offered. Before going to Gaya - Please ensure that you have the list of all of your ancestors - (as usual list of yearly thruvathyanam) + all the departed athai, mama, sithappa, periappa, vagayaras. This apart, the beloved ones (need not be blood relatives) name star, gothram also can be noted down according to the number of pindams we will be offering. Karnataka Bhavan will brief you everything a to z and one need not worry reaching Karnataka Bhavan. one should reach the place the earlier day itself and stay their at night (free lodging) rooms are there. If you want food / tiffin / coffee it is served at very very nominal price, (clean and hygenically served). On Srartha day the food is free - by the time the srartham ends it wil become 4 p.m. One has to be ready to fast from the morning till the pinda thanam at various places is completed. for reaching Vishnu patham etc. share auto facility is available at Rs.5/- per head and every one used to go in that only - unless they have their own vehicles. For Iyengars Pinda thanam is performed only at Gaya Skeshtram. For smarthas they perform in Kasi - Gaya - Thriveni and back to Rameshwaram as detailed by one of the members in ths group. Namaskarams to all. I am Tamil Smartha Brahminof Thanjavur origin. We do not perform the usual annual sraddhams in Gaya. We are required to perform them in our house or in Varanasi. Last year we performed both sraddhams in Kashi and then performed Gaya sraddham, Thriveni, Kasi thirttha sraddhams etc separately (collectively called "Kashi Yatra"). Also we collect beach soil from Dhanushlodi (some pujas done) and immerse it in Triveni. 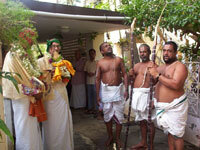 We perform Abhishekam with Ganga jalam to Lord Shiva in Rameswaram on return from Kashi. For us Kashi Yatra is complete only after we make this second visit to Rameswaram. I am intersted to know whether there is any difference in the procedures for Tamil Vaishnavites/ Telugu/Kannada Brahmins. (Also for Madhvas). Karnataka Bhavan at Gaya can be contacted for detailed routing to reach Gaya. wish..... Recently we had been to Gaya and performed our Father's ceremony. rest of the detail can be obtained from respective contacts. I remember the name of the river at Gaya as Phalguni. At Akshaya Vadam, we heard the following local story from the bruhuspathi. Lord Rama with Sita came to Gaya and wanted to do the pinda arpanam to his father Dasaratha at this place. Leaving Sita near a tree, He went to collect materials. As it took some time, Dasaratha appeared before Sita and said he was hungry and asked Sita to provide him with some food. Sita pleaded helplessness and asked Dasaratha to wait until Lord Rama comes with the materials. As Dasaratha could not wait for long, Sita made pindams from sand and offered them to Dasaratha and he enjoyed that food and disappeared. When Lord Rama returned and heard this, Sita told Him that trees, rivers, beahmins, etc. were the witnesses to this happening. But when Lord Rama addressed them, they were silent except the Tree. Sita cursed all of them except the Tree, and consequently, the Tree alone grew and grew and stands even now to this day, but brahmins were cursed - they would never be content however much they get from karthas - river was cursed, - there is no water in it most of the time and it is dry - but the tree grows and stands in all fame. The above is subject to my memory being correct. I am planning a trip to Gaya, Kasi, Allahabad, Ayodhya, Pushkar, etc. during late March/April. In this context, I digged some information on planning this pilgrimage. What I understand and came to know, I am giving below for the information of the group with an anticipation that other members who had had similar experiences will share them with others. Every Hindu has to do a Gaya Sraddham during his lifetime for offering pinda in that soil in honour of forefathers by performing a ceremony with the guidance of local Brihaspathis there. There can be discussions about the Acharams and Anushtanams that are followed by the local Brihaspathis/Pundits there who are involved in assisting pilgrims to do the Gaya Sraddham. I came to know at one time that we cannot take our own Brihaspathi from here to Gaya and perform the gaya sraddham there and we will have to go by the local Brihaspathis in that soil notwithstanding their Acharams and Anushtanams differing with ours. As per a Lifco Publication, the gaya kshetram is a Punya Bhoomi. There was an Asuran called Gayasuran who did penance and obtained a Boon from Lord Vishnu to get his sariram more purified and sanctified than the sareerams of Brahma and Sivan so that anyone in contact with him will become a Punyathma giving no work to Yama in due course. All devas approached Lord Vishnu to stop this practice and on Lord's instructions, a Yaga was performed in this soil on the head of the Gayasuran. Brahma and Siva and Devas were present at the Yagam, but the Gayasuran's head was always dancing and tilting and Lord Vishnu came and stamped His feet on that head which then stopped its movements and the Yaga was successful. On the request of Gayasuran, Lord Vishnu granted the request that all the Trimurthis and all Devas will do Nityavasam in that soil. Whoever offers Pindas at the place where the Lord Vishnu stamped His feet (Vishnu Padam) attain the benefit of their Pithrus for 21 generations obtaining Nalla Gadhi. I am told that Prathyabdhika Sraddham cannot be done at Gaya and we have to do it in our place according to our own Anushtanam and Practices. Gaya Sraddham is a once in a life time ceremony to be done there following the local customs and practices with the local priests or pundits or brihaspthis. One should stay there in Gaya for this purpose for two days, I believe, and the Pinda Dhanam ceremonies take about 8 hours or so in a day. If group members can enlighten everyone with more information or share their own experiences in this regard, it will be a good contribution to vaidheekam karma. Sastras may or may not talk about this, but some Puranas and age old customs and practices do give this significance and importance and if one has a facility, he should follow this practice too as part of his Karma. Sri VAsu vadhyar swami can comment on this. phone 0631-2422723 at gaya for South Indian purohit. Ahalyabai Vishnu pada Road, Gaya, Bihar.